View of “Stretched Terrains,” 2017. This ambitious show is part of a series at the museum that reconsiders modernism in postindependence India, in the era of decolonization and liberalism that is in crisis today. It showcases the work of eighteen artists, photographers, and architects through eight themed galleries. The first room, “Delhi: Building the Modern,” charts civic architectural projects that were part of the Nehruvian vision for a new India. 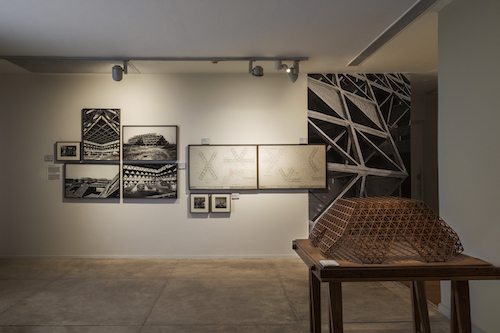 The recent demolition of the Hall of Nations (1972), despite local and international outcry, makes the inclusion here of architect Raj Rewal’s original scale model and Madan Mahatta’s photographs of its construction particularly poignant memorials. While the show foregrounds the well-known cadre of the Progressive Artists’ Group, it’s their lesser-known works that are most compelling, such as M. F. Husain’s vivid sketches and his film Through the Eyes of a Painter (1967). S. H. Raza’s paintings of cityscapes in Italy from the 1950s signal the beginning of his move toward the purer abstraction of his later works. A heavy velvet curtain provides a measure of privacy for viewing a room of F. N. Souza’s loving and thickly rendered paintings of women, some gazing impetuously at us with their skirts drawn up. The inclusion of works by the late 1960s Bombay-based collective Vision Exchange Workshop (VIEW) artists Akbar Padamsee and Nalini Malani gestures toward the need to expand the Indian modernist canon to embrace photography and film. Ashim Ahluwalia’s 16-mm film Events in a Cloud Chamber (2016) strikes a wistful note by re-creating Padamsee’s lost film of the same name (1969). When Ahluwalia asks about Event’s score, Padamsee vaguely recalls “a Sarabhai woman” of whose death he was unaware—composer Geeta Sarabhai, a colleague of John Cage—which reminds us that there are some histories that remain occluded in our attempts to retrieve others, but that something beautiful can arise in reimaginings.